A fashionista’s worst nemesis is her budget, followed closely by credit card limits. Although fighting against these two powerful forces is a diva’s daily struggle, there are creative and budget-friendly ways shopaholics can extend their shoe collections without maxing out their credit cards. One of the most inventive solutions I’ve seen thus far is a new trend called “upcycling,” which involves applying your artistic talent to make an old pair of shoes new again. Shoe-lovers everywhere: get out your paint, ribbons, sequins and glue and prepare for a night of fashion-enhancing fun at your workbench with the following inexpensive ways to revamp those dated kicks. Shoes with metallic toe accents are definitely in this season, but a good pair can often run close to 100 bucks. Why shovel out extra dough for a look you can easily achieve with just an old pair of solid-colored heels, pumps or flats? Blogger extraordinaire, Amanda, recently posted a simple DIY method for turning plain shoes into shiny modern masterpieces with just some gold metallic spray paint, sand paper, masking tape and plastic bags. 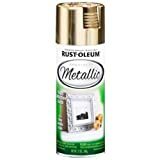 Krylon K05125307 ColorMaster Paint + Primer, Brushed Metallic, Satin, Champagne Nouveau, 11 oz. To make a pair of these gorgeous DIY shoes, start by covering the entirety of each shoe with a plastic bag and securing them with masking tape at the precise cut-off preferred for the metallic toes. Following this step, use the sandpaper to lightly sand each toe and spray 4-5 coats of metallic paint on the desired area. Wait for the paint to dry, remove the tape and voila– a brand new pair of shoes. Blogger and fashionista Kristy, took a worn pair of black Target heels and added an eye-catching hound’s tooth design with the power of a product called Mod Podge. This innovative material allows you to securely stick virtually any fabric to your shoes to create a brand new look that completely covers signs of wear and tear. You simply use a paper towel to measure the region of the shoe you would like to cover with fabric and then trace it accordingly. Following this step, cut along the lines you traced and make sure the fabric you’re applying aligns perfectly. Coat the desired area with Mod Podge, apply the fabric, and cover it with another coat of Mod Podge. Use an Exacto knife to clean up any fabric spillage and you’ve officially got a new pair of shoes. Add fun shoe clips and bows for a personalized embellishment and to make your new shoes really pop. Side note: Mod Podge is also a great choice for making glitter shoes with just a few extra coats and a whole lot of glitter. I believe that within each pair of old and worn shoes is a fun and flashy look just dying to come out. With the above DIY upcycle styles, you can successfully attain the shoes of your dreams without racking up excessive debt. Divas, show your budget who’s boss and get to upcycling those old shoes today. Danielle, who blogs on behalf of Sears and other prestigious brands, loves fall for mugs of hot cider, a good pair of boots and a sumptuous scarf. Read her work at eatbreatheblog.com.